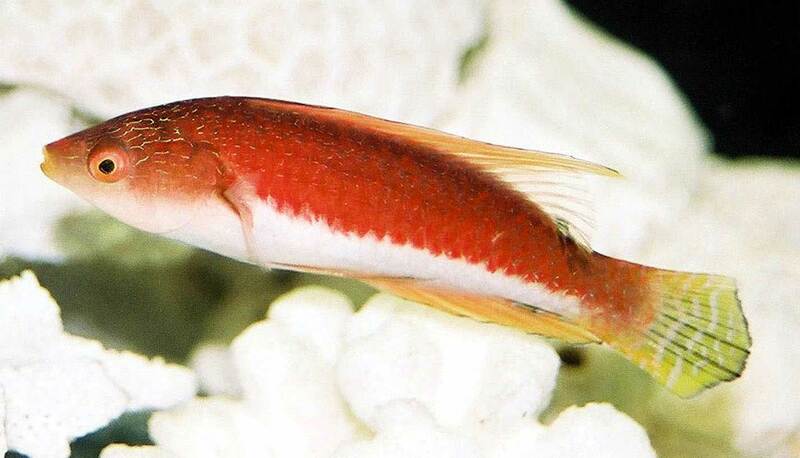 Cirrhilabrus filamentosus, young male. Aquarium pic by Hiroyuki Tanaka. Wrasse growth spurt??? Hi there! When we bought "Ziggy" - our wrasse - we were told he is a Melanurus wrasse. Looking at some online photos though, I'm not quite sure he is. I took the best picture of him that I could for you. Hopefully it will not only help you to help me diagnose his possible problem/illness but maybe you can also verify that he is in fact a Melanurus wrasse. If not - that's okay too. He's Ziggy to us. Ok so the REAL problem here is that Ziggy has been swimming around for about a week and a half now with his mouth open constantly. He never closes it anymore - ever. And it's beginning to worry us. First though, I must tell you that about 6 months ago he went through what we assume was a growth spurt. He was swimming with his head always to one side a bit (which he's doing again) and seemed to have trouble burying himself to sleep.<hmm... what kind of trouble?> One morning we thought he was dead (6 months ago) when we found him buried head and tail but not his midsection.<yes, many species of wrasse bury themselves in the substrate at night> I gently scooped at the gravel near him and he swam out.<yup> Anyway, he eventually - after probably 2 or 3 weeks - was totally fine and he looked like he had grown a ton over night.<yes, wrasses tend to grow rapidly> His head was straight, he seemed to be sleeping better, etc. And I must tell you that we have a clownfish that likes to move the gravel to the front of the tank with his tail so we're constantly trying to make sure there's enough gravel back there for!<LOL> Ziggy to go to bed. I think we're doing a pretty good job of that but maybe we're not if you think that that may be the cause of his strange actions.<your doing a fine job> So now Ziggy is eating well and doesn't seem to be getting picked on by anyone else.<good> He doesn't have spots, isn't scratching, his fins look good, he doesn't seem to be breathing any heavier than normal, etc. but his mouth is open and his head is turned a little to the side all the time again.<A lot of fast moving wrasses swim with there mouths open.. I would not be too concerned with this. If he starts showing symptoms of disease... then worry> We're worried also that since he can't seem to close his mouth (and it is wide open) that he might be having trouble burying himself.<doubtful... he most likely can close his mouth> He seems so uncomfortable. The only other possible "symptom" is that he seems a little more lethargic lately. <Do check your water quality-always check water parameters when fish seem to be acting weird> Last night, we almost thought he laid on the bottom sideways like he was dying but by the time we got close enough to see he was swimming again.<he pulled a Houdini> It was very close to his bed time and he always swims slowly near the bottom and live rock (not so much out in the open water like he does during the day) around bed time. He's always been a very active swimmer.. <yes, waiting for his last meal> I'm almost positive he did that last time too though - the lethargy thing not the laying on the bottom thing. During the day, he appears to be almost normal except his head, his mouth, and I'd say he's a bit less active than he was before this. <again check water quality> Are "growth spurts" typical of a wrasse?<yes> That's what the last time seemed like to me but this time his mouth is open and it's really got me concerned. Any thoughts? <don't think there is a problem... as long as this fish continues to eat... and your water checks out fine, I would not be concerned.> I really appreciate your guidance. Thank you! Question: I work at a fish store and do aquarium maintenance on the side. I have recently (in the past few months) come across a rather interesting (yet very bothersome) phenomenon. The first is with wrasses, especially with those of the genus Anampses and Coris. What happens is that within a week or two of getting the wrasses in, their lips appear to roll back exposing their teeth, the refuse to eat (or eat very little) and die within the same week. Are you familiar with this condition and do you know how to treat it? My other question is that I have seen (for no apparent reason, water quality checks out on all counts) black spots develop on a tang the size of Oodinium dots. Fresh water baths help to remove the ones off the fish, but when the fish is put back into the tank it is totally covered again within a couple of days. In advanced cases the fishes skin appears as though it dehydrated and wrinkled and is about to fall off. It seems to only affect tangs. Do you know what it is, why it starts up, and how to treat for it in a reef type environment? I would appreciate any help you can give me on this matter. My reputation as a professional is at stake here. I am having great difficulty at locating any information on these two conditions. Thank you for any help you can offer. Bob's Answer: Rob, the prognathal genera of wrasses you mention are dying as a consequence of being shipped for too long in too small a bag from the source or your supplier... very common with Anampses and Coris spp. They need to be put in large enough bags to easily turn around and either have fine sand shipped with them or the bags laid on their side so the animal can't rub its face in the corner. On arrival such animals should be quarantined and treated topically and/or via antibiotics (orally if they're eating). The black spots are a not so free living turbellarian flatworm of the genus Paravortex. A simple freshwater dip/bath will eliminate them BEFORE being placed in the main display tank... once the critters are established, biological cleaners may keep them in check otherwise.